One Note Feature Updates is one of the greatest applications for keeping a running tab of your meeting notes well-organized and accessible at all times. If your company is using Office 365 or considering making the move, you should have access to both the desktop and online version of this awesome notetaking tool. OneNote gathers users' notes (handwritten or typed), drawings, screen clippings and audio commentaries. Notes can be shared with other users over the Internet or on a network. In OneNote, users can create notes that can include text, tables, pictures, and drawings. Unlike a word processor, OneNote features a virtually unbounded document window in which users can click anywhere on the canvas to create a new text box at that location. OneNote, similar to Google Sheets, saves data automatically as the user makes edits to their file. OneNote saves information in pages organized into sections within notebooks and integeates seemlessly with Microsoft Teams and SharePoint. In March, Microsoft added 3 new features across platforms. From new navigation, to roundtrip editing of embedded files and phrase search, you can now find exactly what you need and stay in the flow with OneNote. New elements have been incorporated to the navigation in OneNote for Mac and OneNote for Windows 10. In the updated navigation, switch easily between your notebooks, search results and recent notes using the buttons along the left-hand rail and use the drop-down button across the top of sections and pages to view additional notebooks. If you want to maximize your canvas, you can hide navigation by clicking the notebooks icon at the top of the left rail. Click the icon again when you need to navigate your way to another page, section or notebook. The updated navigation is currently rolling out to all users on Mac and is available for Office Insiders on Windows 10. It will be available to all Windows users in the next few weeks. Microsoft is working to bring this update to OneNote Online and OneNote for iPad as well. See here for a detailed refresher on the updated navigation. 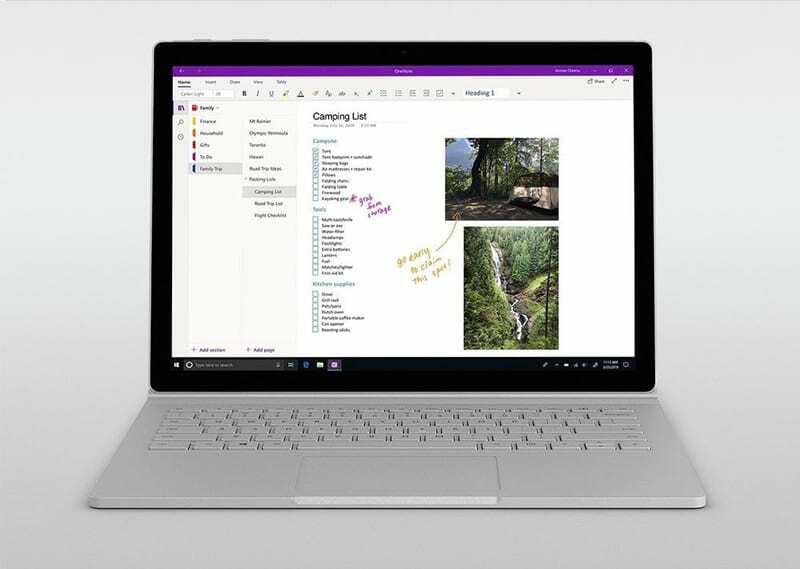 Starting this month, you can edit files embedded in notebooks more easily on OneNote for Windows 10. Users will be able to open files, make edits and have those changes saved seamlessly without having to save a new version or re-embed into the notebook. To try this feature, open a file embedded in a notebook and make edits. Don’t worry about saving the new changes as a separate file and re-attaching to your notebook – your changes are already synced and ready to be viewed in OneNote! Make sure AutoSave is on, edit what you want, and close the file when you’re done. The next time someone opens the file from the notebook, those latest changes will be there. This feature will be rolling out to all users on OneNote for Windows 10 over the next few weeks. Microsoft’s newest addition to search capabilities is phrase search. To try it today, open the search pane and put a phrase between quotations to get more relevant search results. Putting your search terms in quotations will search for an exact match rather than each word separately, providing more relevant search results.This feature is available for all users across platforms, so try searching for exact phrases in quotation marks to find exactly what you need across sections and pages! If you're interested in learning more about OneNote or some of the other awesome tools that come with Office 365, contact us today. Or if you're already using OneNote, here's a short video with some helpful tips to keep your notes organized. Do you find yourself searching through files or notebooks to locate your most recent meeting notes? Or are you constantly transcribing notes from paper to a Word document? If so, it's time to jump on the OneNote bandwagon. Microsoft OneNote is one of the greatest applications for keeping a running tab of your meeting notes well-organized and accessible at all times. If your company is using Office 365 or considering making the move, you should have access to both the desktop and online version of this awesome notetaking tool.